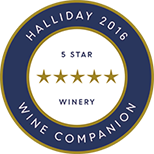 Questions by James Halliday (JH), answered by the winemaker, Paul Smith (PS). May, 2016. JH - What can we expect from this wine with age? The intense black fruit and spicy opulence of this wine will develop greater complexity with cellaring. Early to mid-season harvested shiraz provides excellent balance and silky tannins, which will age beautifully for 15-plus years. JH - What’s the biggest cellaring mistake people should avoid and why? Avoid drinking wines past their prime! I choose wines of intensity and balance, buy a few, then enjoy them over 10 to 15 years unless they have a proven pedigree for greater age. Micro-parcels of estate fruit picked during early-mid March for red and black fruit flavours, 13.5 to 15 baume; open-fermented, matured for 18 months in new and used French hogheads. This is a joyously full-bodied shiraz, with the promised fruit complexity and more; the tannins and oak contributions play second fiddle to the fruit. Below its acrid flinty topnote, and maybe a hint of bruised mint, this is pure bitter cherries, as in Morello juice. It's one of the most elegant wines in the entire line-up, which is not to say it's in any way weak: uh-huh. Estate-grown, open-fermented and basket-pressed, then matured for two years in used French (70%) and American (30%) oak, neither fined nor filtered. Good colour; the bouquet is fragrant and spiced, the medium-bodied palate with spicy/savoury black fruits and a long finish. Excellent outcome for the vintage. An alluring fruit focus sings of the purity of McLaren Vale's 'Scarce Earth' single block imperative. Impressive flavour concentration of blackberry compote and mixed spice is uninterrupted by used oak, which lends its support to soft, fine tannins, confirming an easy and early drinking style. Open plum purple fruit. Quite floral plum essence. Chocolatey palate has fine grained tannins. Quite a fine open style with good balance. Graceful for the Vale. Licoricey. Showing its oak on the second taste but good. There's an alluring fruit focus to this tiny volume newcomer to Scarce Earth. Blackberry compote and mixed spice carry impressive fruit concentration through a long and finely structured palate. Seasoned oak lends structural support without interrupting fruit expression, which lingers supple and primary amid soft, fine tannins, making for an easy and early drinking style. 92 Points. Drink: 2014 – 2018. $55.